Der Artikel Simcha Lev-Yadun: Defensive (anti-herbivory) Coloration in Land Plants wurde in den Warenkorb gelegt. Ihr Warenkorb enthält nun 1 Artikel im Wert von EUR 175,23. 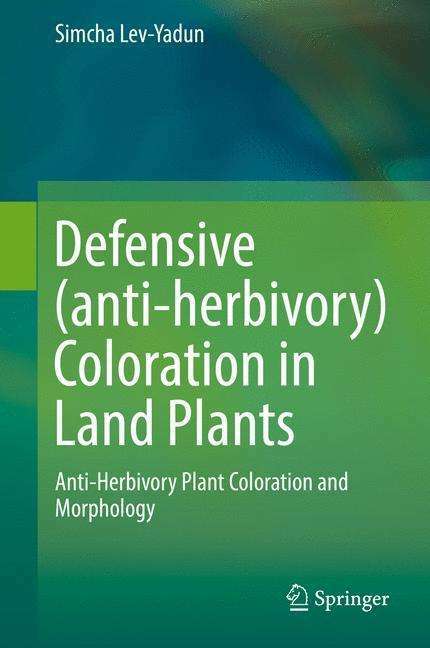 This book presents visual plant defenses (camouflage, mimicry and aposematism via coloration, morphology and even movement) against herbivores. 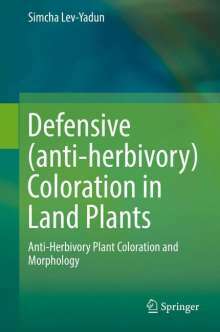 It is mainly an ideological monograph, a manifesto representing my current understanding on defensive plant coloration and related issues. The book is not the final word in anything, but rather the beginning of many things. It aims to establish visual anti-herbivory defense as an integral organ of botany, or plant science as it is commonly called today. I think that like in animals, many types of plant coloration can be explained by selection associated with the sensory / cognitive systems of herbivores and predators to reduce herbivory. It is intended to intrigue and stimulate students of botany / plant science and plant / animal interactions for a very long time. This book is tailored to a readership of biologists and naturalists of all kinds and levels, and more specifically for botanists, ecologists, evolutionists and to those interested in plant / animal interactions. It is written from the point of view of a naturalist, ecologist and evolutionary biologist that I hold, considering natural selection as the main although not the only drive for evolution. According to this perspective, factors such as chance, founder effects, genetic drift and various stochastic processes that may and do influence characters found in specific genotypes, are not comparable in their power and influence to the common outcomes of natural selection, especially manifested when very many species belonging to different plant families, with very different and separate evolutionary histories, arrive at the same adaptation, something that characterizes many of the visual patterns and proposed adaptations described and discussed in this book. Many of the discussed visual defensive mechanisms are aimed at operating before the plants are damaged, i. e., to be their first line of defense. In this respect, I think that the name of the book by Ruxton et al. (2004) "Avoiding Attack" is an excellent phrase for the assembly of the best types of defensive tactics. While discussing anti-herbivory, I do remember, study and teach physiological / developmental aspects of some of the discussed coloration patterns, and I am fully aware of the simultaneous and diverse functions of many plant characters in addition to defense.